I know! I'm a little late. lol Sept. 1st to Oct. 31st. 60 scarves in 60 days! Check out Crochet with Dee. You can actually send the scarf where ever you want to. If you have a favorite charity send to that. You do NOT have to send it to Dee. Just send her a note saying that you did make one and where you sent it so that she can keep track. You can send to places such as: Orphan Foundation , Knit your Bit , Warm Up America . You may even be able to find a local charity to donate to. With winter approaching, there are so many in need of warm items. With my shawls finally caught up and completed, I'm going to try and get one out. If you need an easy pattern, check out Crochet Pattern Central. You can also get great patterns at Crochet Cabana. So many patterns to choose from. Beautiful shawl, Bunny! Love it. 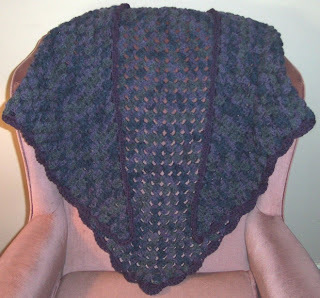 Beautiful Shawl, I just love the colors that you used. Could you share the type af yarn used? If not that it okay too. The shawl is wonderful. Your work always is sooooo pretty. And you are right about Sandie's patterns. She always has great patterns that are easy to follow and without errors.